Well, I’m enjoying this tremendously just as a perfomance piece.+1 Also, BVW much? 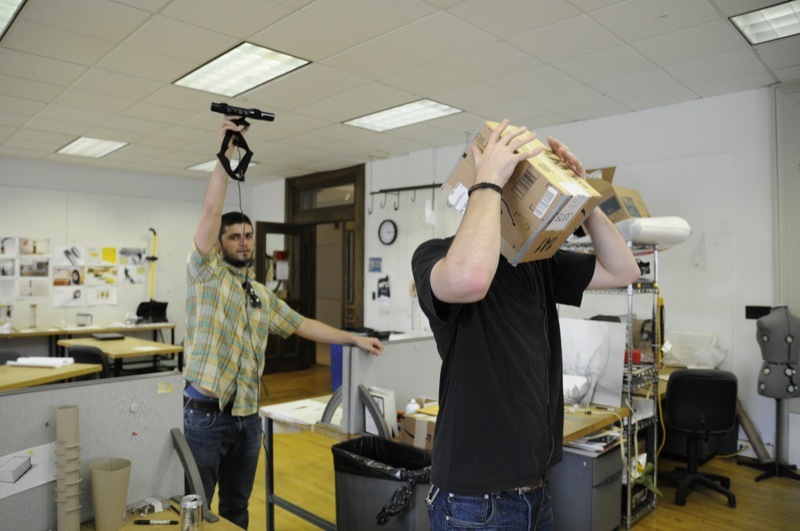 Can’t find the video, but this reminds me of another project in which a guy had a similar camera setup, but just with video. He wore a headset that let him see himself as though he were a third-person game sprite, and the video is basically just of him running into people on the street. Pretty classic. ^yeah golan showed us that one. Ah. Well, there you go. That’ll teach me to miss lecture. Can you incorporate it as apart of the the back rig? 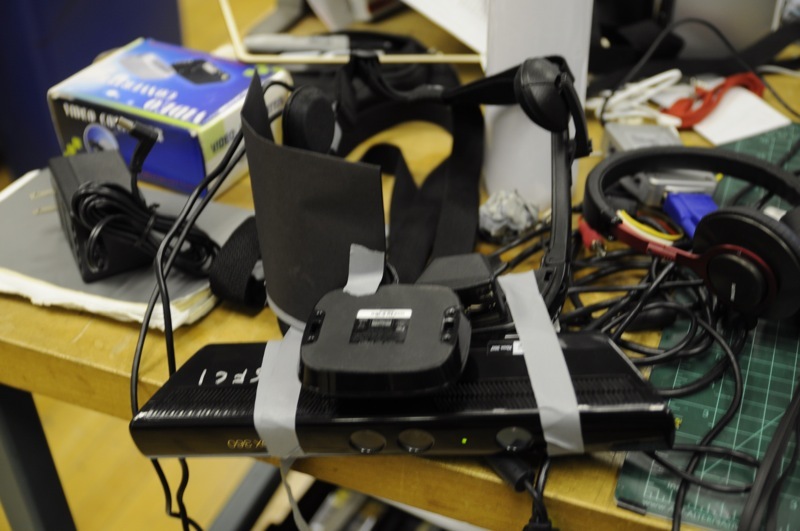 Maybe using bent conduit as a frame for the kinect rig would be light weight + strong enough to strap your hardware to and go mobile. I like the interactive part of your project. I think there is HUGE potential in this project. How about do it for games. Way to go Jonathan!! I really like this project. It’s like a 3d shooting game where you see yourself from the outside. 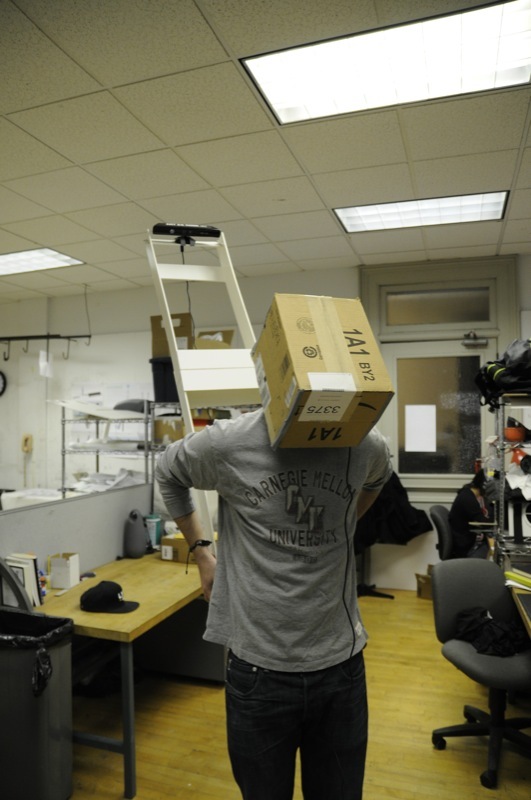 Did you try mounting the kinect to the head itself? Why do u need the constructions and the height above the person? It reminds me a bit of Johnny Lee’s Wii thing in that, instead of moving around in front of the Kinect, you mount the Kinect and move it around with you. I’d love to play around with it. The rig on peoples’ backs is cool. 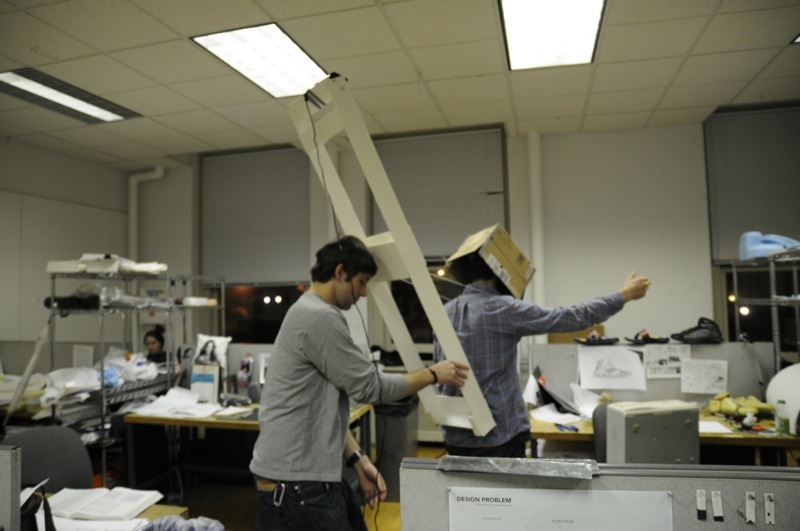 I think I agree with the comment that it’s more fun for people to watch friends do this than to do it themselves, but I think that mgiht be true for all of VR. 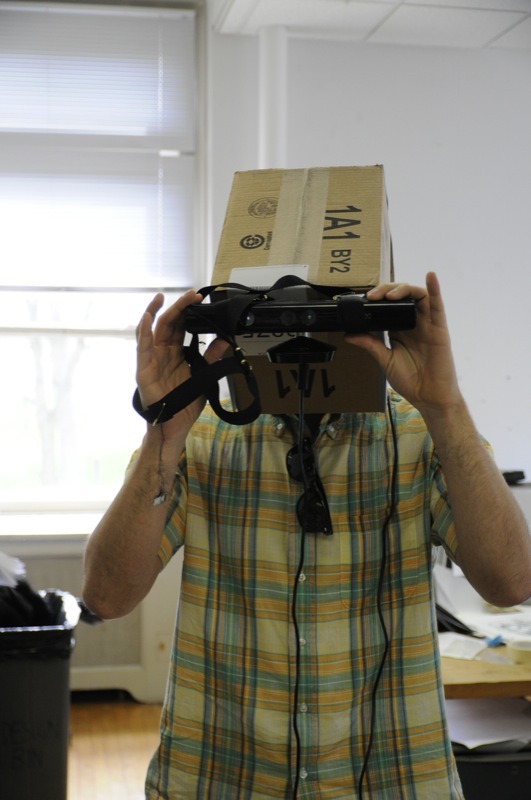 What if there is the possibility to attach a mechanism that rotates the kinect so that one can have views of the environment that normally does not. +1 to Golan’s comment. Take this and do something totally unique! 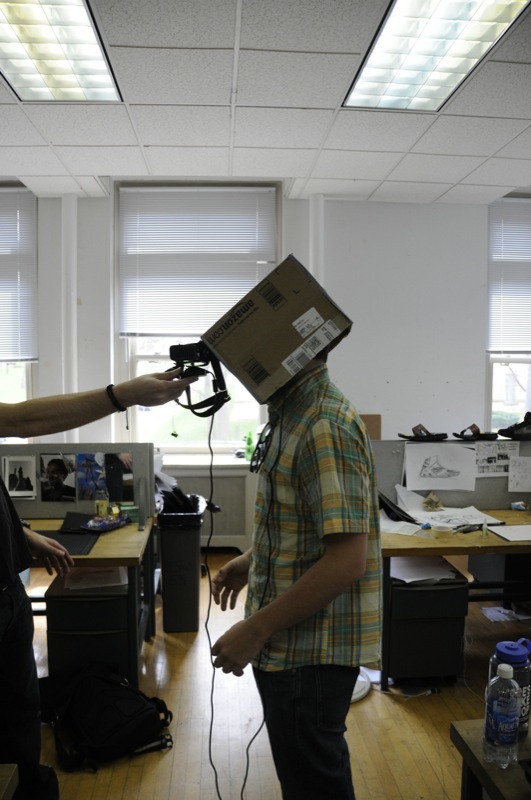 “The box on my head is very helpful, actually.” Awesome presentation, live demos are always fun. I feel like you could use more than the depth data to make an easier visual, but it’s a very striking visual for the audience. When I tried it out, the uselessness of my head was very jarring, which may or may not be what you’re going for. 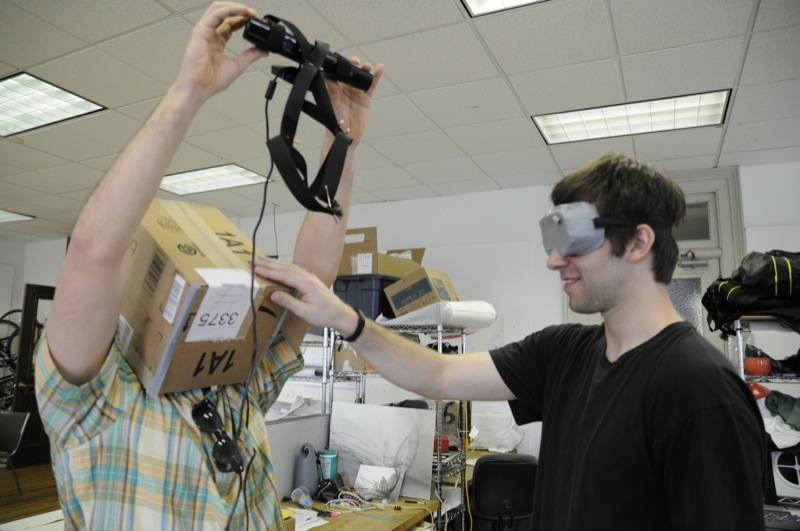 I would have liked to try an experiment where the Kinect was connected to my head, rather than body. This is very fun. Great project. I think when you started to control and move the field of view I found it especially exciting. 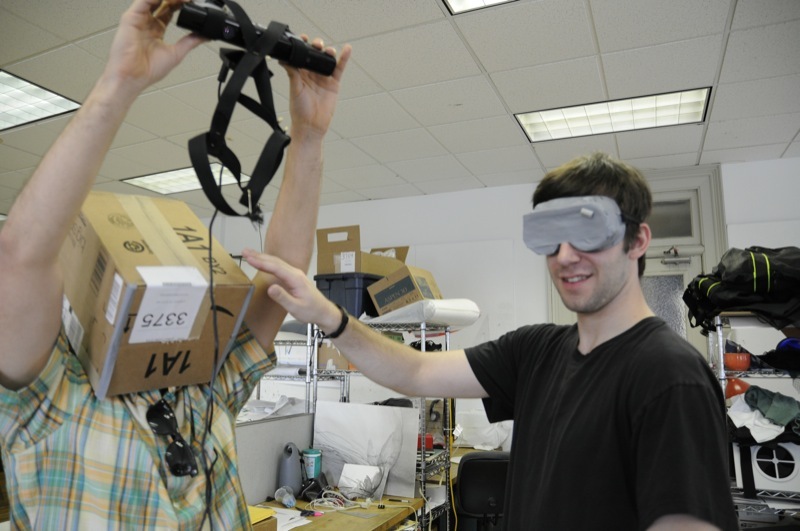 I think you can come up with some fun ways to augment our vision. Make us into superheros in some way. i think this is a good start. nice job implementing this prototype in such a short amount of time. i just feel like i still dont understand where you’re going with this project. I’m very excited to find out though, so good luck in the future steps! 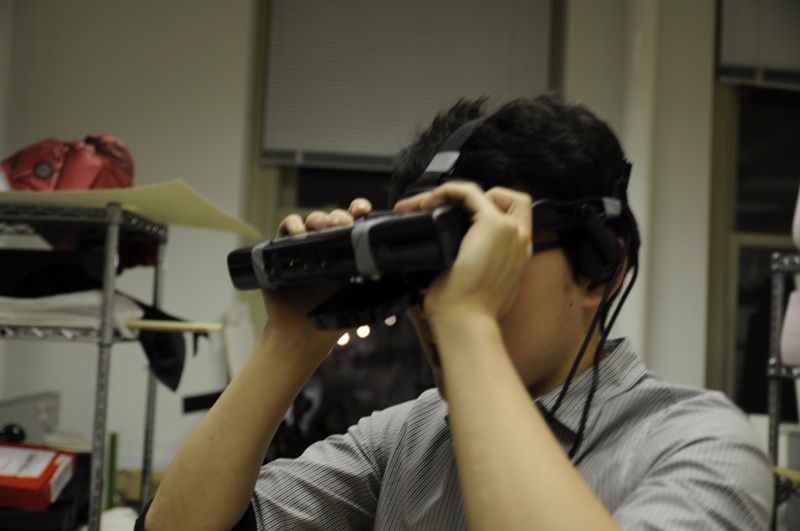 I think what your interested in is more complicated than just obscuring the field of vision for the user. I agree that attemptin to create a more sensative vision that what we already posess is a more interesting result. —- see James Auger’s style of planning for sketching. The most telling part of his work comes from his very cute and realistic situations he imagines of the future. Time for some sketches. Concepts! Designs! What’s the app? Take out the sharpie, start concepting. Good start! You could use this to transport yourself somewhere else ..